Thermal Oxidizers – Adwest Technologies, Inc. Many industrial processes result in the production of air pollutants such as volatile organic compounds, hydrocarbon, solvent fumes and halogenated and hazardous air pollutants. As these pollutants can cause serious environmental and biological damage, it is vital that they are managed and disposed of properly. Thermal oxidizers offer a means of disposal for toxic air pollutants and are used in several industries including polymer and resin manufacturing, food processing, printing, pharmaceuticals, painting, roof manufacturing, and much more. Thermal oxidizers are a large piece of equipment and are therefore most widely used in industrial settings that yield high emissions. It is important to consider the requirements of a given application prior to purchase to ensure optimal oxidation occurs. As thermal oxidizers function by burning or heating the contaminants, temperatures are particularly important and range from 1000 to 1800°F on average. The solvent load and volume must also be taken into consideration as well as the required airflow. 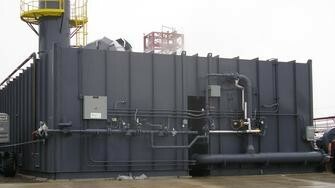 A properly selected thermal oxidizer should boast destruction efficiency rates between 90% and 99%. The higher this percentage the lesser the pollutants released into the atmosphere. As concerns over emissions mount, the EPA encourages and often requires the use of air pollution control mechanisms such as thermal oxidizers which are a popular choice in industrial settings with high process air emissions. Thermal oxidizers can be categorized as direct flame or non-flame. The former is the simplest option as it requires a firing box into which the process stream flows. A burner converts the materials as needed. The time needed to complete this goal varies. Non-flame oxidizers are often more popular as they offer ample opportunity for the recovery and reuse of the heat energy. In these systems, the tainted air is forced through a heated tube which slowly increases the temperature until the impurities are broken down. The purified air is then exhausted into the atmosphere. Heat recovery systems in this particular type of pollution control equipment may be either recuperative or regenerative. Recuperative models recover about 50% to 75% of the generated heat using a plate or shell and tube heat exchanger which uses the heat from recently cleaned air to heat the dirty incoming air. Regenerative models are much more efficient with up to 95% energy efficiency as they use ceramic heat transfer beds. The energy and cost savings of these types of thermal oxidizers make their application more popular than direct flame options in many industrial settings. For controlling the release of volatile organic compounds, the most extensively used emission control systems probably is thermal oxidizer. The system, basically, uses high temperature to destroy the organic compound in to water and carbon dioxide. The destroying efficiency depends on numbers of things, including, the residence time of the waste gas in the combustion chamber, the temperature of the combustion chamber, the concentration of organic compounds at inlet, type of volatile organic compound type, and degree of mixing, which commonly is known as turbulence for mixing. For an oxidizer to reach 98 percent or greater efficiency, which can also be termed as, exit compound concentration of 20 parts per million by volume, it is important that the chamber combustion temperature can reach up to 1600 °F, the apt residence time is 0.75 second and appropriate turbulence is achieved. However, when halogenated compounds are involved, the optimum temperature is 2000 °F, and the resident time almost is equal to one second. Moreover, acid gas scrubber is also need that is installed at the outlet; apparently, it is much harder to control halogenated volatile organic compounds. In a typical thermal oxidizer, the flow rates of gas are in a range of 0.24 to 24 standard cubic meters per second (sm3 /sec), which in terms of standard cubic feet per minute (scfm) translates into 500 to 50,000. The minimum temperature thermal oxidizers must operate at is the ignition temperature. However, at ignition temperature it is possible to achieve high destruction, thus, all thermal oxidizers run at temperatures that are higher than the ignition temperature. For a standard organic compound, the thermal destruction can be achieved in the range of 1100 °F and 1200 °F). However, present day regulations makes it necessary that oxidizers operate at 1800 °F to 2200 °F, when categorized hazardous waste is involved, so the total destruction of the organics in the waste air stream can achieved. The modern thermal oxidizers are designed to destroy volatile compounds over wide range of concentrations. However, as the volatile compounds, as the name implies, can explode, the concentration of the compounds in the air stream should be below the lower explosive limit (LEL), for safety considerations. There is a rule that dictates if the concentration of the waste stream is safe enough to be processed, it says, 25% of the LEL is safe; it is also known as a safety of four. If the concentration is higher than safety limit, then the concentration is diluted with the use of ambient air. After bringing the economic factors in the equation, it is said, for thermal incinerators perform optimally at concentration of compounds at inlet should be around 1500 to 3000 ppmv. At this concentration, the heat of combustion of compounds or hydrocarbon gases helps to sustain the high temperatures of the combustion chamber, without the need of any auxiliary fuel. What Determines Performance of Thermal Oxidizers? Thermal oxidizers, also known as thermal incinerators, are pollution control equipment that are employed to regulate the emission of volatile organic compounds, carbon monoxide and volatile hazardous air pollutants from the industrial exhaust by burning them into water and carbon dioxide. 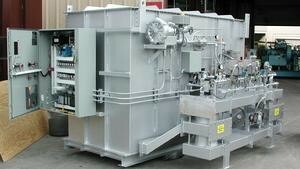 Depending on the applications, different designs of oxidizers are available. However, their performance is determined by the same set of factors. Here we are discussing them all, which include outlet carbon monoxide concentration, fan current, exhaust gas flow rate, outlet carbon dioxide concentration, outlet oxygen concentration, outlet combustion temperature, and outlet volatile organic compounds concentration. When an oxidizer is used primarily for volatile organic compounds air pollution control, the concentration of carbon monoxide at the outlet of the oxidizer is the indicator of combustion efficiency of the system. If carbon monoxide remains in the exhaust, then it points that combustion is incomplete, which, by extension, means the system is performing below the required efficiency. When an oxidizer is used to check the carbon monoxide, the outlet concentration of carbon monoxide is a direct indicator of inefficiency. The fan current, in general, matches the flow rate of exhaust gas. Thus, in some cases, the fan current is a direct indicator of the gas flow rate. If fan current increases, it signifies that the residence time—a pre-determined time to achieve full combustion—is decreasing, which shows the combustion is incomplete. Efficiency of a thermal oxidizer is indicated cumulatively by the combustion chamber temperature and residence time. To identify the residence time, come to know about the flow rate of exhaust gas. As the flow rate increases, the residence time comes down, which consequently, indicates the efficiency of an oxidizer has come down. However, in processes where the flow rates remains constant, the gas flow rate is not performance indicator, since temperature is the major factor in the those processes. The outlet concentration of carbon dioxide and oxygen is not a performance indicator but a compliance indicator when volatile organic compounds are involved. The concentration of both gases at outlet is monitored because it tells the changes in air rate. Excess air rate can be used in the calculation to normalize the measured volatile compound to a standard oxygen or carbon dioxide level. For compliance purpose, monitoring both the volatile compounds and oxygen concentrations is necessary, especially when emission standard specify compound concentrations corrected to a specified oxygen percent. The concentration of volatile organic compound at the outlet of the thermal oxidizer is the direct indicator of the efficiency and performance. The strong indicator of the performance is the outlet combustion temperature. The thumb rule is: the higher the temperature at the outlet, the higher the efficiency of an oxidizer. It is advised not to use a single indicator to determine if an oxidizer is performing below par or on par, it is better that all the related data is accumulated together then analyzed to determine the performance of emission control systems. Thermal Oxidizers Thermal oxidizers reduce air pollution by heating contaminated air until it reaches temperatures high enough to break down the hazardous compounds, leaving carbon dioxide and water vapor as byproducts.